Hey guys it’s Ash and many of you guys may have already heard about the news of the new dark troop, the Bowler! If you haven’t heard, then allow me introduce the Bowler! So looking at his stats, at first sight they don’t really look that impressive. Let’s compare him to a level 6 Wizard. The Bowler occupies 8 Housing Spaces, while the Wizard occupies 4, so the Bowler occupies twice the space. A level 6 Wizard has 164 HP, while the Bowler has 380, so he’s much more bulkier than a Wizard. And some of you guys may remember me saying a while ago in one of my videos is that one thing we’re missing is a bulky ranged attacker. And it looks like this is what we’re getting. The Bowler throws his bowling ball to deal two consecutive hits in a straight line path. A level 6 Wizard does 180 damage, while a level 3 Bowler does 85, so only about half as powerful as a Wizard. But you have to take into account that the Bowler has a much greater range and also can do damage to two buildings at a time, not one, unlike the Wizard. So yea, the Bowler by no means is inferior to any of the other troops, and also from I’ve seen, he’s not overpowered in any sense either. He’s just a very balanced troop, and he has a special property in the game. The Bowler wasn’t created to beat Inferno Towers, although that is something I desperately had hoped a new dark troop could do, but what I’ve seen, he was created for a different purpose. I’m going to show you guys two attack footages with the Bowler, and then at the end of the video we’re going to look over it again, and I’m going to show you guys what I believe is the best strategy with the Bowler. Believe it or not guys, this game actually needed the concept of the Bowler, and I’ll get into explaining why at the end. The first attack is against one of my old but very popular base, the Heart of the Champion base. These are attacks on a developer iPad, and many of you guys also know that I build a lot of high level bases that are very popular among the community that you guys probably come across all the time, without even realizing that that is a base created by Ash! So I’m also guessing the developers use my bases to test new troops as well, which is very cool. 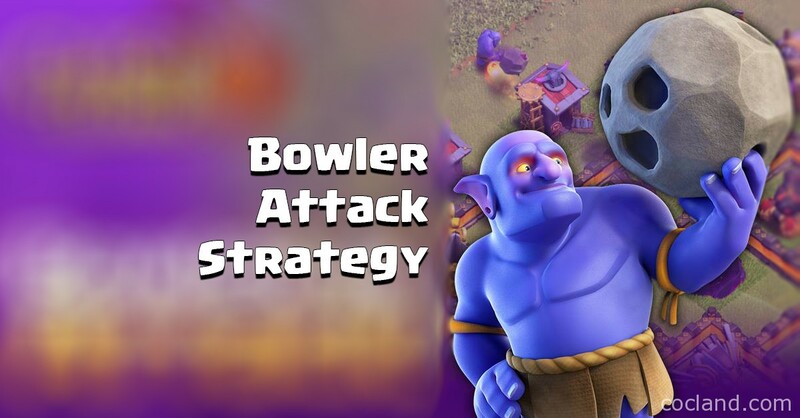 So once the update launches and I get my hands on the Bowler, I’m gonna show you guys some great attack strategies with him. Also remember, when the Lava Hound first came out, you had so many people undervaluing it, but once people finally learned to use him, they finally realize what a devastating force the Lava Hound is. So yea, don’t be fooled by your initial impressions of the Bowler. So hope you guys like the video, and don’t forget to subscribe to my YouTube if you haven’t, because, trust me, I’m gonna be working on a lot of great strategies with this new troop. Thanks for reading guys! Do you have any question want to ask?